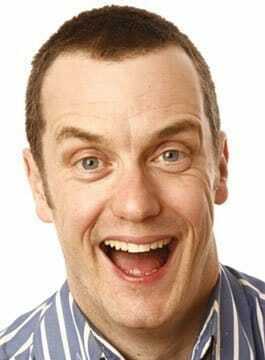 Paul Tonkinson – Stand-Up Comedian and Presenter. Paul Tonkinson is a self-confessed professional northerner – and far worse, a celebrity Manchester United fan. Paul Tonkinson is a star of comedy in all its forms. Be it on stage, in character or as a TV host, this man does not fail to make you giggle. Still relatively fresh-faced, Paul Tonkinson has actually been at the game quite a long time. Back in 1992, he was winner of the Time Out New Act of the Year Award and then completed the comedy double when he won Time Out Stand Up Comic of the Year in 1997. He is enjoying a lot of success at many corporate occasions. Paul has entertained clients such as Tesco, GCU, Cable and Wireless, Heinz, BMW, Ford and many more. Paul’s television work includes; The Sunday Show (BBC2), The Stand Up Show (BBC1), Stand Up (Granada), Comedy on the Road (US TV), Raw Soap & Raw Soap II: Presenter (Carlton), MTV Hot: Presenter (MTV), The Big Breakfast: Presenter (CH4), Comic Relief Does Fame Academy (BBC 1) and Michael McIntyre’s Comedy Roadshow (BBC 1). UK gigs for: The Comedy Store, Jongleurs, Banana Cabaret, Up the Creek, Last Laugh, Comedy Company, Comedy Club, CKP & independent clubs. International gigs: Combined Services Overseas (Iraq, Falklands, Afghanistan, Cyprus), Spain, Belgium, Middle East & Far East. New Zealand Comedy Festival.